ShutterstockDon’t blame a vitamin deficiency. 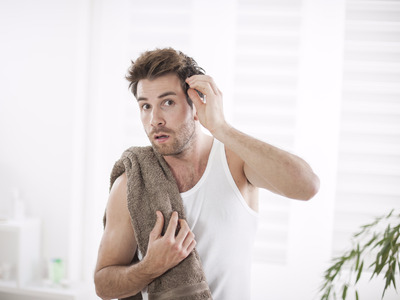 Hair loss is a tricky subject for most men who suffer from it. They don’t like to talk about it, fearing that drawing attention to the problem will only make it worse. The most important thing to remember is that it’s not your fault — it’s genetic. If you’re suffering from hair loss, and you don’t already know the source, it’s likely male pattern baldness, according to hair scientist Dr. William Yates of Dr. Yates Hair Science. Yes, there are other causes of hair loss, but they’re exceedingly rare. Stress? Unlikely. Infection, chemotherapy, medication, or disease? You’d probably know what the cause was before your hair even started falling out. Could it be a vitamin deficiency? Very doubtful. Another major cause of hair loss is traction alopecia, but if you don’t wear a hat or put your hair in tight buns, braids, or ponytails, that won’t affect you. So put down the vitamin supplements, and stop worrying. There are four things that can treat or prevent the hair loss we’re dealing with here, and the sooner you get treated for the right cause, the better off you’ll be.